This route is described from N to S but could be done just as well in reverse. The traverse begins on "Low Pass," just SW of Gladys Lake, which is on the Grand Pass trail. From Low Pass it reaches Lillian Lake; when planning this traverse, take into account that Lillian Lake is a quota area. A limited number of permits are issued for this area at any given time. Bearproof containers are required for areas where food cannot be properly hung, which is the bulk of the traverse. An ice axe should be carried. From the lakes the route stays high to Cameron Pass. 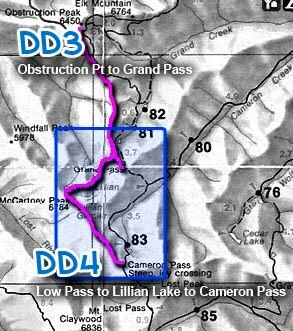 From Cameron Pass, a party can continue by trail to make a loop back to Obstruction Point via Cameron Creek and Grand Pass trails or continue S through Lost Pass and into the Dosewallips. If continuing to the Dosewallips, a day should be allowed to enjoy the Lost Creek Basin. Other trail connections are also possible. On the north end, this traverse can be linked with DD3 (Obstruction Point to Grand Pass). See the published Climbers Guide for detailed approach information. Strong, fast parties can easily make Lillian Lake in one day from Obstruction Point. Less strong parties or ones that want to enjoy the meadows in the floor of the Lillan River valley should allow 1.5 days or more. The section from Lillian Lake to Cameron Pass should be allowed a full day, assuming you don't want to stop in one of these wonderfully isolated upper drainage areas. Prior to leaving Low Pass, it is worthwhile to spend several minutes visualizing the route across this valley and up to the lakes. From the top of Low Pass, travel S while descending the W side of the pass. Traces of the Lillian Lake trail that was abandoned in 1949 can still be found but are quite sketchy. There are a series of routefinding errors that are commonly made when hiking to Lillian Lake. The first of these is to descend too quickly and too far when leaving Low Pass. A moderate descent or following the traces of the old trail will bring you to a point about a third of the way up a large talus field. Here you have three options. (1) The first is to cross the talus field and gain the crest of the rocky ridge on the other side. A point can be found to get off the ridge to the S and descend the broad, grassy, W-facing slope. (2) The second, and perhaps the best, option is to cross the talus field aiming toward a talus-covered bench that is near both the rocky ridge and the lower margin of the talus field. Descending SW from the bench, you can find a narrow, sloping passage between the toe of the rocky ridge and a nasty gully that parallels it. This passage allows you to contour around the toe of the ridge and out on the the grassy slope mentioned above, but considerably lower. (3) The third option is to descend into the meadow just below the talus field. The old trail likely traversed the top of this meadow. It is possible to climb out the upper right (SE) side of the meadow and join the second option just below the toe of the rocky ridge. This is quite arduous at best. The S margin of the meadow is, for the most part, impenetrable Alaska cedar and brush. However, a good route can be found near the lower end of the meadow. Here the woods suddenly recede S. A heavily-used game trail can be found in the upper left (SE) corner of the area. The game trail leads out to the grassy slope. There is a second meadow below this one that should not be descended into, as there is no easy passage out of it. Once out on the grassy slope, an easy descent can be made into the huge, exquisite meadows of the valley floor. Many excellent camping options are available here. Contour across the valley floor, crossing several creeks. Here the second major routefinding error is made. It is common for hikers to leave the W side of the valley floor too soon and too steeply. This does work but entails much steep sidehilling and wretched brush. At what seems to be the last stream, it may be better to go downstream a short distance and contour around as much of the two intervening ridges as you can, in meadow, occasional brush, and open forest, to the creek draining Lillian Lake. This creek is hidden behind the farthest ridge and is not visible from many points on the main valley floor. With luck you can find the abandoned trail on the E side of the creek and climb into the broad basin holding Lillian Lake. Once in the large, glacier-carved basin, hike to the lake, which is tucked high in the head of the basin, using a minimum-impact route. Good campsites abound around the lakes. For many hikers this will be there destination and they will return the way they came. To continue to Cameron Pass, hike to the scree/talus or snow slopes S of the lake. Late in the year a good trail climbs this slope. This trail is easily seen from the lake in the midday sun. It is not so visible when shadows are on the slope. The trail/snow easily gains about 400 ft. to a small pass. From the pass, the views of both the lake and the Lost River drainage are spectacular. Good trail heads S across the W face of McCartney Peak and around the ridge down into the head of an unnamed creek drainage. This is a very pretty area of rock, streams, and meadows. The trail gets a little sketchy here but still can be followed out of the drainage and up onto the ridge to the S. At this point, the trail vanishes. The urge to head for the ridge top should be suppressed. Instead, continue a gently rising contour into the head of the next drainage. In this drainage you will encounter a few streaks of scree coming down the valley floor. Angle up to the SE across scree, meadow, and woods. Getting to the ridge crest too quickly requires a significant descent to pass a deep notch in the ridge. From the notch, upper Cameron Basin is visible. From the notch, a slump ridge provides easy travel S until a scree slope is encountered. Get as high and as far as possible before launching out into the scree. A faint trail that leads above the stunted trees may prove helpful. In dry weather, this is the most tedious bit of hiking on the traverse. Fortunately, it is fairly short. Once clear of the scree, you can fully indulge the urge to head for the ridge top as you hike S to Cameron Pass.